A roller coaster experience for us & our tastebuds, an evening with moments of dissappointments & ecstasy…………thankfully eventually we walked out smiling. We walked in seeing a huge poster of Pizza with seafood, took a seat, waited for the waiting staff to reach us (which incidentally took a while), & to be told that it is not being served. 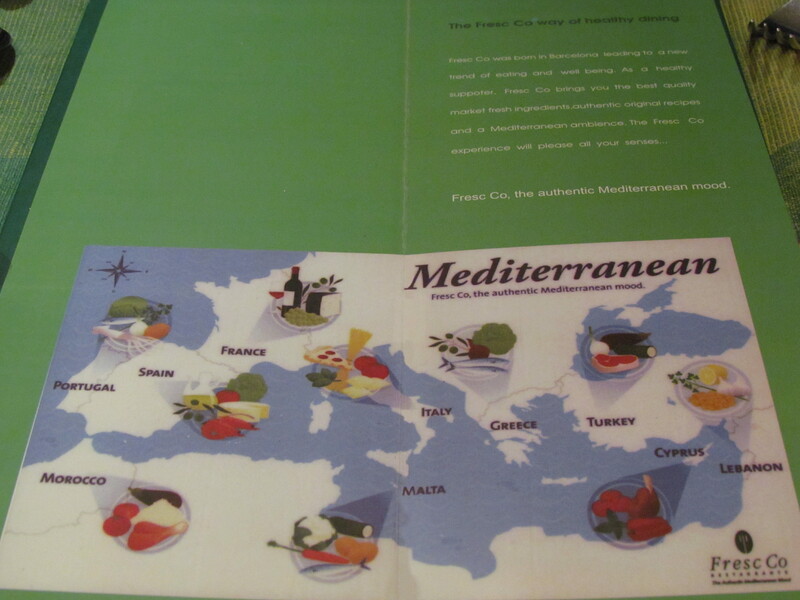 So we asked, ‘why do u have the picture outside?’ – pat came the answer ‘sir, we change our menu card often. 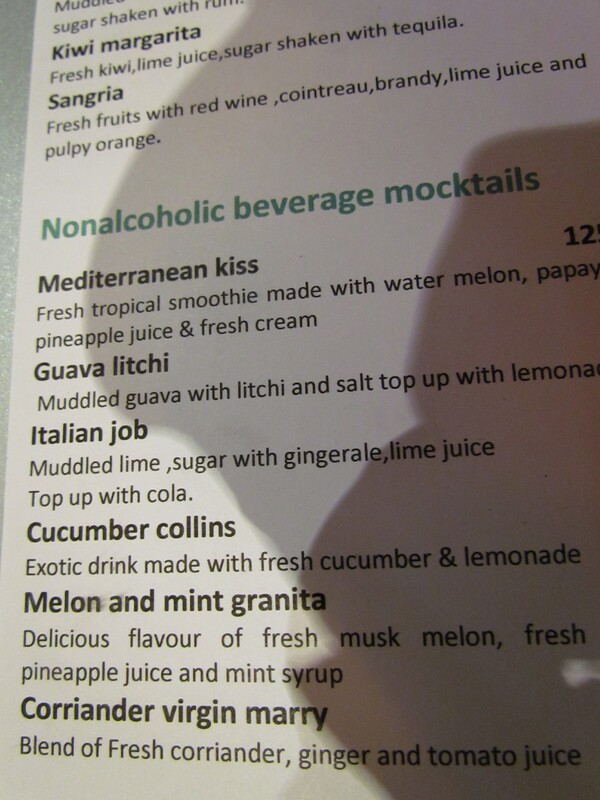 We do not have this any more in the current menu’………….. was that a joke??? Isnt one supposed to replace product advertisements for which the product has been discontinued? Very frustating start. The Huge picture of seafood pizza outside Fresc co which is not a part of the menu!!!!! The overall service was slow, it was very difficult to make an eyecontact with the staff even though at times we saw them chatting near the counter. It felt like Castaway Tom Hanks in the island trying to wave at the aircrafts flying above to rescue him but those guys r busy flying. Must mention that when they are at the table, they are very nice to us & in fact some of them are real smart & have good product knowledge. What surely needs a mention is the live music. That is something for which we might revisit – performance by Gregg on Friday, Saturday & Sunday evenings. They have some good vegetarian & nonvegetarian buffet spreads. I wud not drive from home to go & eat at that buffet again but if I am around & am hungry, will surely consider this as an option. Fresco at the Domestic Terminal however feels like an Oasis – Relatively much higher standard of food than the regular fast food kind of chains that r present at the Airport. Infact I have eaten more often at Fresco in the airport than at AmbiMall. In alacarte we had some cool Greek style prawns, some weird Chelo Kabab, an excellent Sicilian Pizza & a very enjoyable virgin mojito. 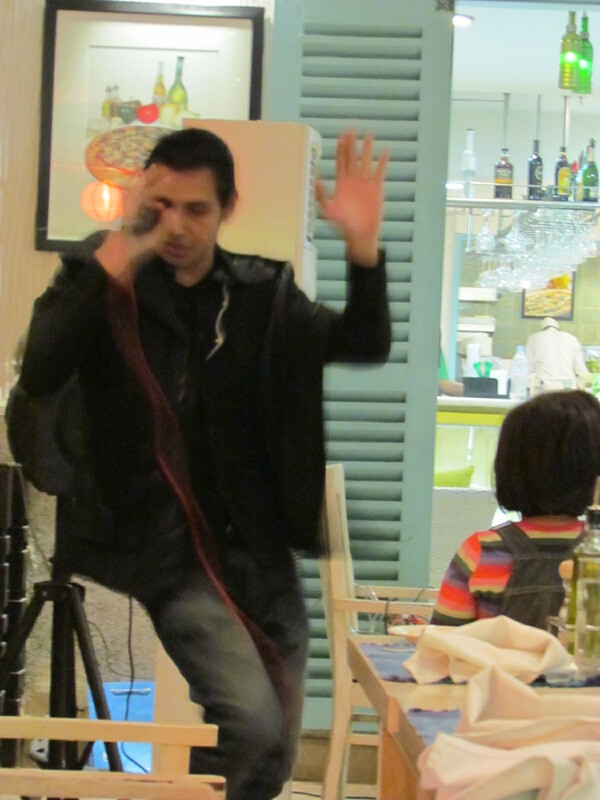 A Guy & a Girl were singing & entertaining the Guests. We were lucky to be there on a Friday as the amazing singer Gregg is here only on Fridays, Saturdays & Sundays. He kept on singing peppy numbers, twisting them, making funny moves, funny sounds, making sounds almost to the level of horbola etc. playing around with his voice & his instruiment like it was no one’s business. While all this hyper activity, he was trying to maintain eye contact with all guests in turns, gyrating at times, dancing & singing. He was enjoying it & so were the guests. 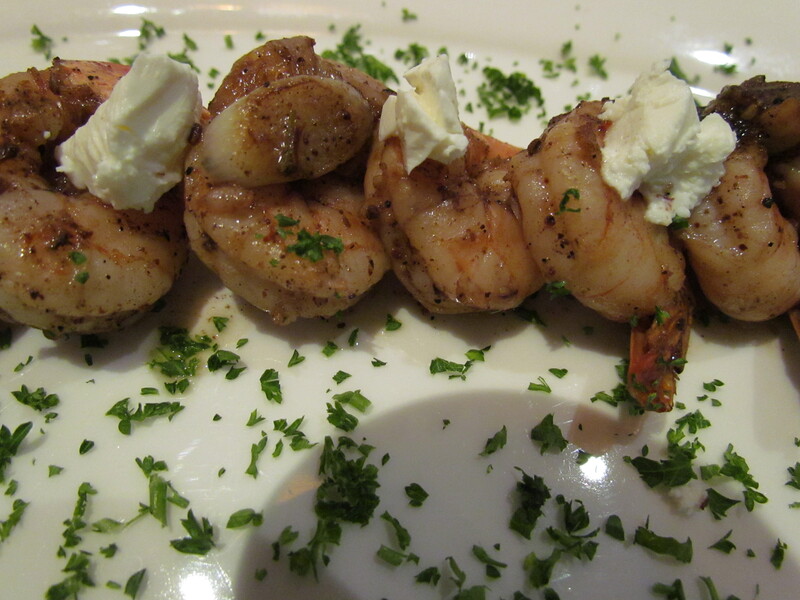 For starters, we asked for Greek styled prawns – spiced prawns cooked in white wine, feta cheese & tomato salsa. The portion was tiny – I guess 8 pieces of prawn for Rs. 400. But, the taste was awesome & we were bowled out with the flavors of the spices & the prawn. The feta cheese added a superb angle to the whole taste. Loved the dish & wud reorder in a future visit. The tomato dip was not tomatoee & was superb good. While we were looking at the menu card we came across ‘chelo kabab’. No bong from Kolkata wud not know what I am talking about. Peter cat park street, a legendary Restaurant is famous for its chelo kabab (chicken, mutton & egg) which we have all grown up eating. I also have a superb Chelo Kabab experience at an Iranian restaurantnamed Lala Rokh, in Boston, Massachuchets, run by an Iranian lady. This one was also superb with the only difference that it had tenderloin (beef) kababs in it. Ok, to sum it up, a chelo kabab usually looked like this in the the above places – a bed of fine long aromatic soft rice with a big dollop of butter and kababs of different shapes, sizes, looks & textures placed in groups on the bed of rice. In both the above places, it was heavenly. With that expectation we ordered the Chelo Kabab & what came was a shock right from the look of it. 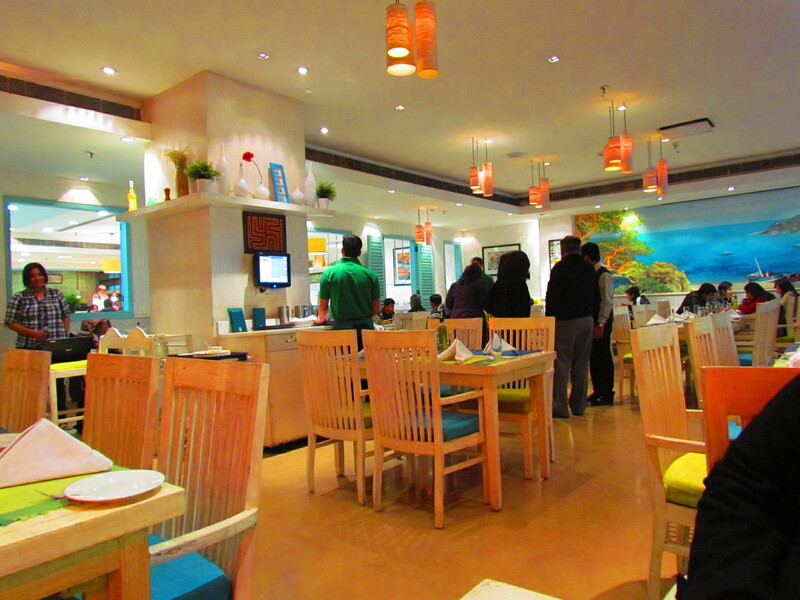 Here at Fresco, it was displayed in European style – minimalistic. The rice & meats were also searched separately, it had nothing in common to any chelo kabab that I have had. 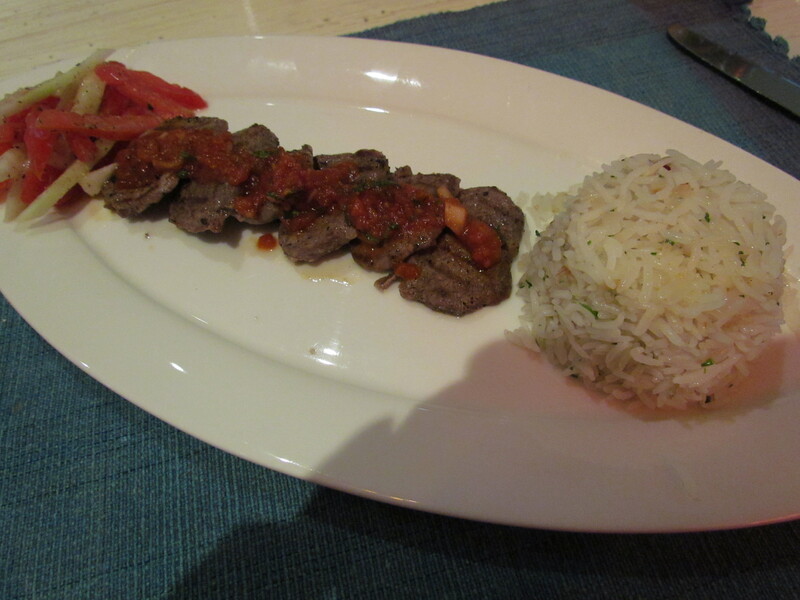 It turned out to be just a grilled tenderloin kabab with onion pilaf & sumac tomato. As we took a bite, the tenderloin pieces tasted as expected – like tenderloin pieces, the rice was far from soft & buttery. All parts tasted good on their own but failed miserably as a dish overall. Total Dissappointment – visually & tastewise. 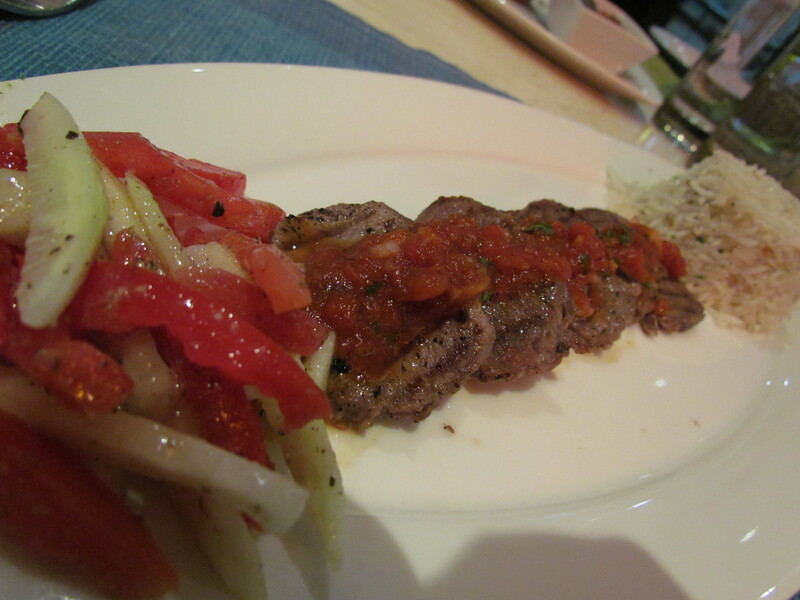 However, if u do not have a background to Chelo kababs,u might like it as it is – tenderloin with rice & salad. The portions were baby size as well for around Rs. 500. Since we still had space, we planned to go for a pizza. The waiting staff, came after a while & asked us what dessert we want, to be told that we want some more main course. 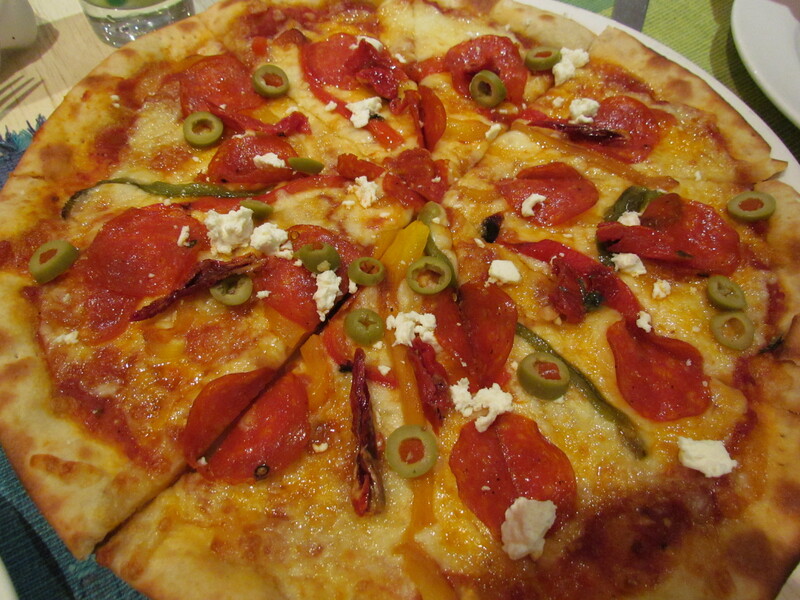 We asked for Sicilian pizza (vegetarian) with an extra topping of pepperoni……..Outstanding, wow, too good to be true…..In fact we liked it so much that we did not use oregano or chilli flakes after a long while. The pizza had a super thin crust – unlike some other thin crust pizzas, the base was soft like a tandoori roti in the middle & crunchy on the sides. The topping was very juicy & unbelievably tasty with flavors of yellow & red bell peppers, sundried tomatoes, olives & tiny chunks of feta cheese on the top. The feta cheese added uniqueness to the feel & flavor of the pizza. The sundried tomatoes were a blessing. An outstanding pizza after a long time in Gurgaon. In my mind it is now competing with Primavera Pizza of Spagetti Kitchen & Provencale Pizza of Toninos. 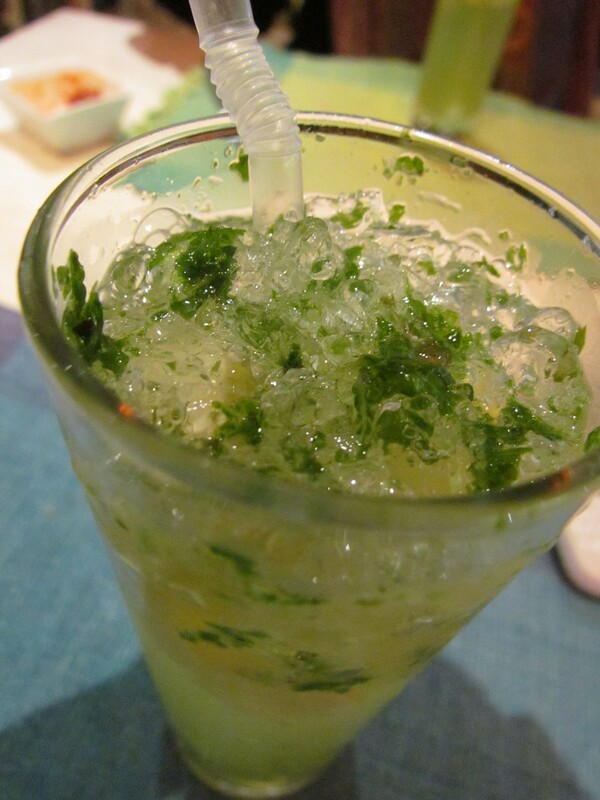 We washed all this down with Virgin Mojito made strong, bold & good to taste. There were phases in the evening when we were discussing ‘will never come back again’ except in airports & then at other times things were better than expected. As I said, the experience here was like a Roller coaster ride, but was quite enjoyable, in hindsight. 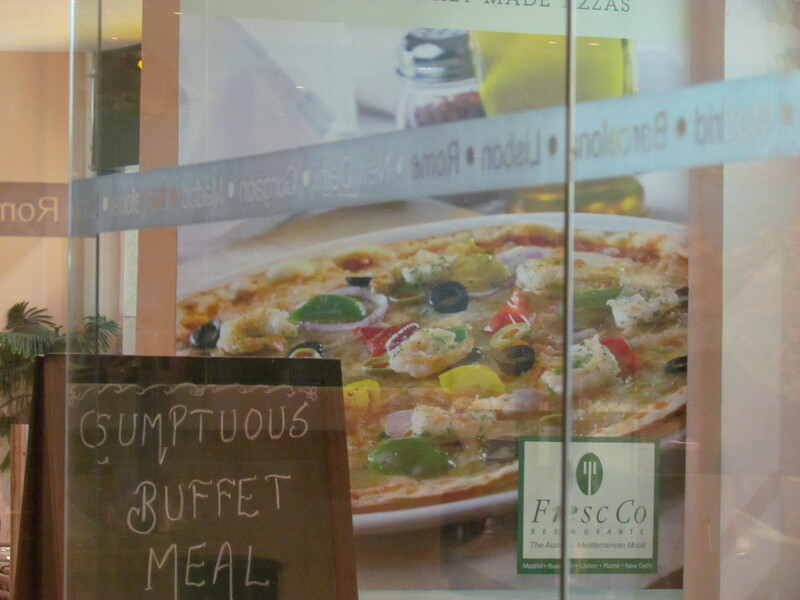 Fresc Co is mostly known for low – mid priced buffets but they make good pizzas as u wud have read about above. 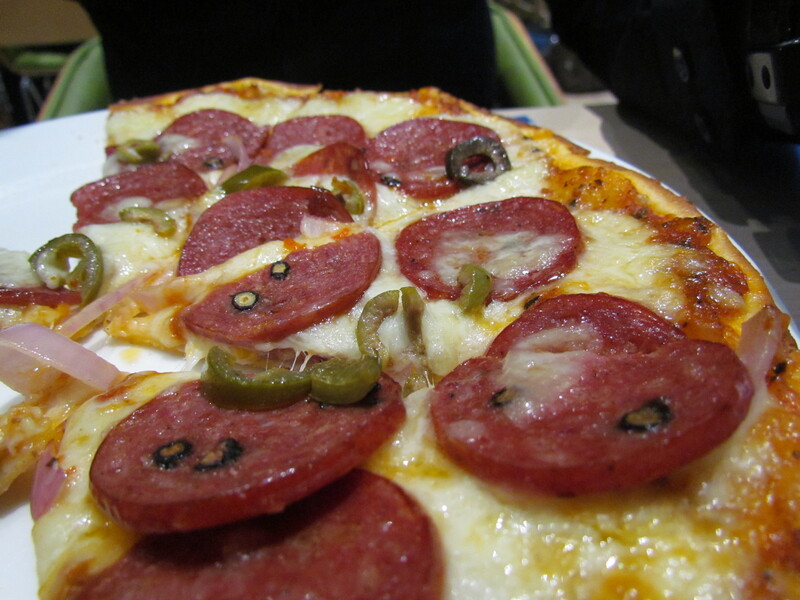 We remembered that from our earlier experience & tried it out pizzas again at the Fresc Co restaurant at Delhi Airport Terminal 2…………… & it was a YUMM experience again. 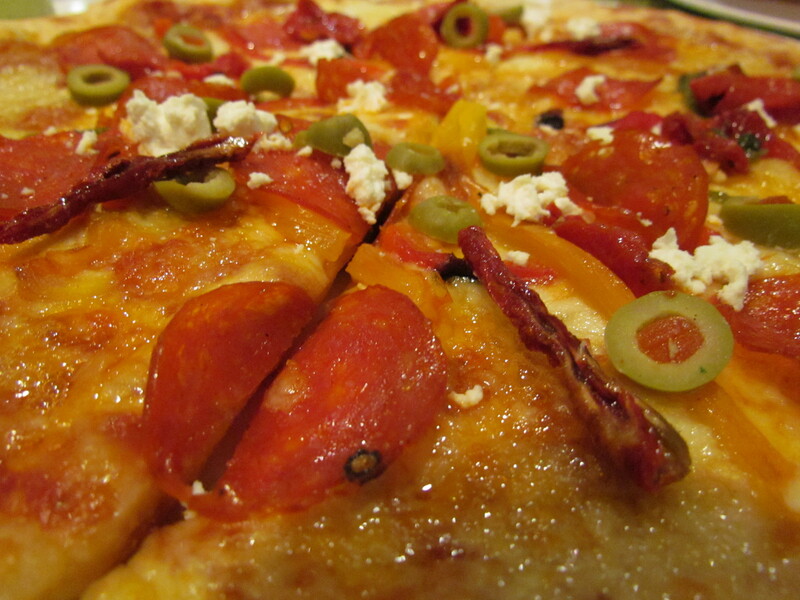 Thin hand rolled pizza crust topped with juicy & flavorful cheese & some good chorizo. Wow. Rate that pizza 4.3/5. Check it out urself next time u r flying out of T2 & write back ur experience……………..